Mondesi's House: How Did I Miss This? Take a look at the photo above. It's Bill Mazeroski, ready to cross home plate just moments after hitting a walk-off home run to end the 1960 World Series. Notice anything? How about this: who the heck is this guy, and does anyone else agree that his appearance in this photo is rather unnerving? For all the times that I've seen images of this moment, I have never noticed the tie-wearing, crowbar-wielding, Jeff Gillooly-looking "baseball fan" in the proximity of a jubilant Maz. The greatest moment in baseball history is ready to climax, and this guy is not even looking at what's going on. I'm sure that he was looking for a free souvenir in the pre-eBay society of 1960 Pittsburgh. But isn't his inclusion in this historic Pittsburgh moment a little...creepy? He's gotta be the Pirates' front office head of security. Who else could get on the field with a tire iron that fast. Besides, in those days they didn't worry about how much damage they did, just that they cracked your skull open. 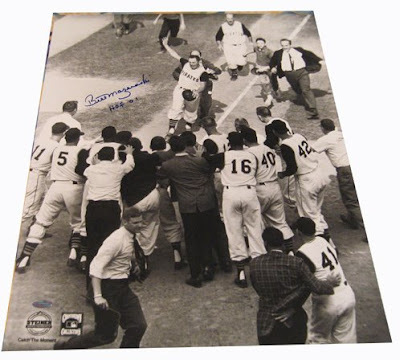 "the Pirates just upset the heavily favored Yankees on a walk off homer in game 7, I better get down on the field with my crowbar and ignore Maz crossing home plate..."
No doubt ready to pry the pitching rubber or home plate right out of the ground.